Times Internet Ltd. (TIL) announced launch of India’s first weekly magazine purely for tablet computers on Wednesday. 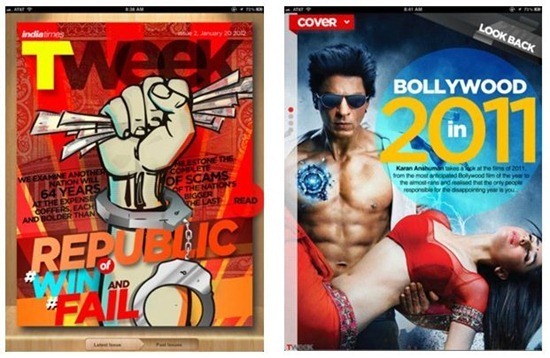 This Weekly magazine – TWEEK – has been developed by TIL in partnership with GENWI, a cloud based mobile publishing company. Currently, it is available only for iPad, but soon will be ported for iPhone and Android devices. TWEEK does not concentrate just on one vertical, but it has been put forth as a general interest magazine spanning a wide range of global stories from a wide range of genres that are tailored to your interests and likes. Along with traditional Textual stories, TWEEK users will be able to experience Audio/Visual & Multimedia content as well. Times has done well by launching this “tablet only” magazine, which will further leverage the content already available with them. Also, because TWEEK promises to present readers with stories of their interests & choices only, users can do away with clutter of non-interesting things. As, TWEEK has been launched just couple of days back, iTunes has not registered too many downloads. But, the 10 users who have have rated the app have given it 4 stars. I am sure we will see many media houses launching similar apps in days to come, specially because Smartphones & Tablets are the “in” thing now!